A 14-year-old girl presented to the emergency room after mild head trauma. In the emergency room, she was noted to have scoliosis. Nearly 1.5 years after her initial presentation, the patient presented with numbness and tingling in her legs, back pain, weakness of her right leg, and constipation. 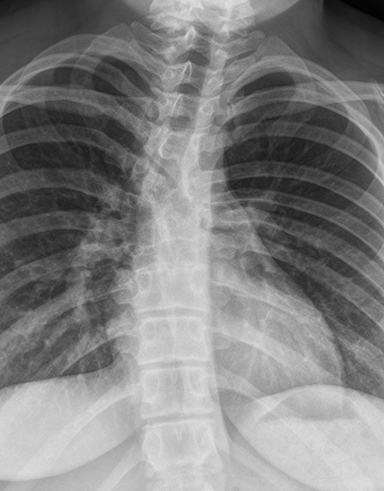 Initially, a scoliosis X-ray was performed. It showed a 15-degree dextroconvex thoracolumbar curvature between the T2 and T12 vertebral bodies. In addition to the curvature, there was a segmentation anomaly involving the T4 through T8 vertebral bodies with possible fusion. 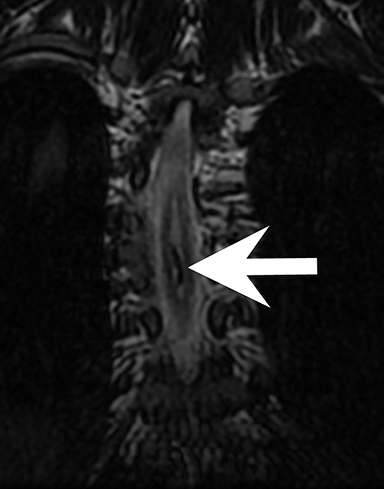 An MRI without contrast of the whole spine was then performed. It showed a Chiari 1 malformation, a small syrinx between C7 and T2, and a split spinal cord beginning at the superior aspect of T5 and extending to the superior aspect of T9. 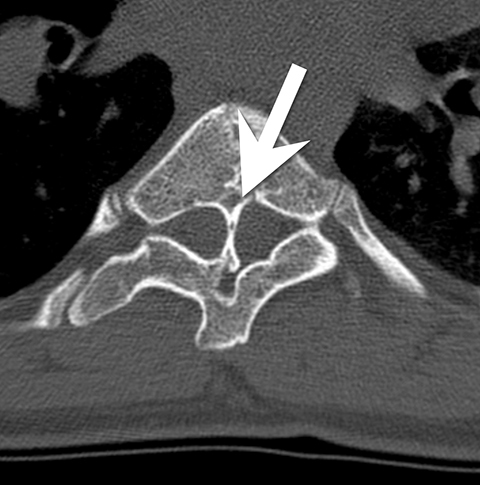 A T1-weighted hypointense bony septum was present at midline at the T8 level. 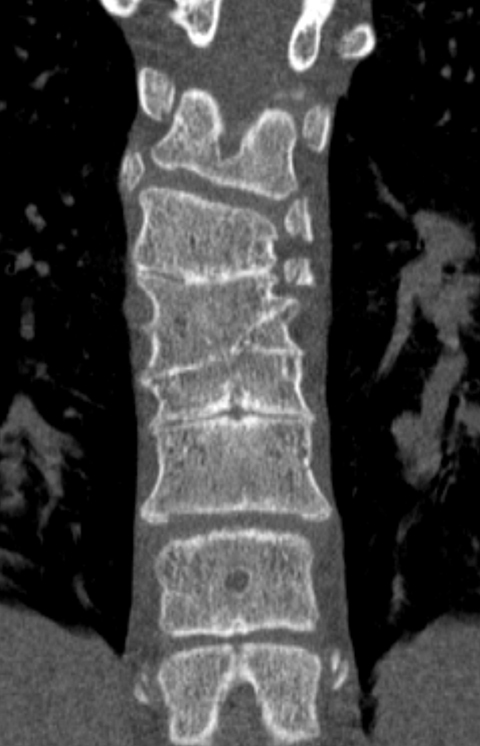 Computed tomography showed the same findings, confirming diastematomyelia with a bony septum at T8 and fusion of the T6 through T9 vertebral bodies. 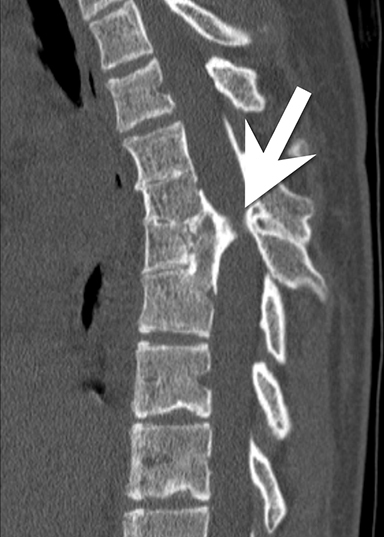 Diastematomyelia: a type 1 split spinal cord malformation. The differential diagnosis includes dimyelia (complete spinal cord duplication) and diplomyelia (the presence of an accessory spinal cord). On presentation this patient did not have any functional defects. Imaging helped to diagnose diastematomyelia, a Type 1 SSCM. The patient’s findings of a Chiari I malformation and scoliosis are associated with her diagnosis of diastematomyelia. Patients are often asymptomatic at birth and do not get motor and sensory dysfunction, along with constipation, until later in life. While this was initially an incidental finding, the use of imaging allowed her to receive proper treatment as soon as symptoms arose. Cheng B., Li F.T., et al. Diastematomyelia: A retrospective review of 138 patients. The Bone and Joint Journal. 2012; 94: 365-372. Gan Y.C., Sgouros S., et al. 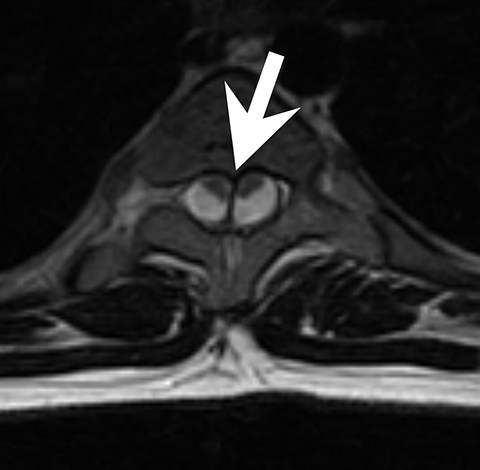 Diastematomyelia in children: Treatment outcome and natural history of associated syringomyelia. Childs Nerv Syst. 2007; 23: 515-519. Turgal Mert, Ozyuncu Ozgur, et al. Prenatal diagnosis and clinicopathologic examination of a case with diastematomyelia. Congenital Anomalies. 2013; 53: 163-165. Ajayi Olaide, Sadanand Venkatraman, and Asgerzadie Farbod. Type I split cord malformation: Literature review, case presentation and surgical technique. JSM Neurosurg and Spine. 2014; 2: 1026. Sonigo-Cohen Pascale, Schmitt Pierre, et al. Prenatal diagnosis of diastematomyelia. Childs Nerv Syst. 2003;19:555-560. Saitsu Hirotomo, Yamada Shigehito, et al. Development of posterior neural tube in human embryos. Anat and Embryol. 2004; 209:107-117. Martin K., Krastel A., et al. Symptomatology and diagnosis of diastematomyelia of children. Neuroradiology. 1978; 16: 89-90. Pediatric Radiological Case: Diastematomyelia. Appl Radiol. Prepared by Dr. Aly and Dr. Alexander Towbin while at the Department of Radiology, Cincinnati Children’s Hospital, Cincinnati, OH, and by Dr. Richard Towbin while at the Diagnostic and Interventional Radiology Department, Phoenix Children’s Hospital, Phoenix, AZ.